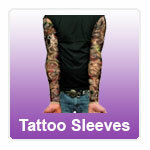 Fake Tattoo Sleeves are made from Nylon cloth and can be worn on the arms or the legs. The material is flesh coloured and then and covered with tattoo inspired artwork. They are best worn under a short sleeved T-shirt and the wrist edges can be covered with a bracelet or watch. Great design tattoo sleeves made from nylon. Old school tattoos. This is an ideal way to fool your friends or just find out if sporting a full arm of tattoos are for you.